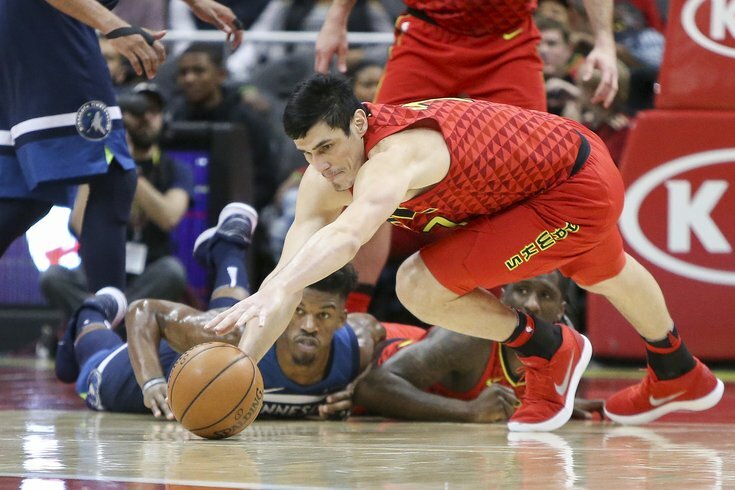 Atlanta Hawks forward Ersan Ilyasova dives for a loose ball in front of Minnesota Timberwolves guard Jimmy Butler in the third quarter at Philips Arena. Just 33 games into his tenure with the 76ers, Trevor Booker's time in Philadelphia has come to a close. A team source told PhillyVoice on Wednesday afternoon that Booker has been waived in order to clear room on the roster to sign veteran forward Ersan Ilyasova. Booker's release was first reported by Mike Scotto of The Athletic, and interest in Ilyasova was first reported by Shams Charania of Yahoo over the weekend. Bringing back Ilyasova came as a bit of surprise to everyone, including the Sixers themselves. When Ilyasova's name first appeared as a buyout candidate on February 23, sources within the Sixers organization were surprised at the development. Their prior read on Ilyasova was that he was happy with the opportunity he had in Atlanta, and they expected to stand pat after the Marco Belinelli acquisition brought them to 15 players on the roster. But Ilyasova's apparent change of heart altered the plans in Philadelphia, and as a result, they ended up cutting a player (Booker) they gave up a second-round pick for in December, as part of the trade that sent Jahlil Okafor and Nik Stauskas to Brooklyn. Philly, I appreciate my short time with you guys, great fans and a great future. There are two ways to look at this series of events. The optimist would say Booker's terrible fit was obvious during his time here, and the Sixers should be commended for not compounding the mistake of acquiring him by cutting someone else to save face. The pessimist would say you just cut a guy you relinquished a draft asset for just under three months ago, and misread his fit in the first place. The truth is probably somewhere in between. Going out and obtaining Booker in the first place probably showed a misunderstanding of their team needs, but they did the "right" thing instead of doubling down and trying to justify the first move. Now, on to Ilyasova. Sixers fans are plenty familiar with his skill set after his 53-game tenure with the team last season, and his numbers in Atlanta have been almost identical to the season prior. In fact, his three-point percentage this season (35.9 percent) is identical to what he shot during his Sixers tenure, and the Sixers will thank their lucky stars if he can replicate that shooting on decent volume this time around. What changes compared to his first year in Philly is the role he'll be expected to play. Ilyasova assumed the starting role for most of his first Sixers stint, something that won't happen this time around. Dario Saric has progressed to the point that he is a nailed-on starter and an integral part of their crunch-time unit, and Ilyasova will be the guy asked to come off the bench this time. He should be a big help to Philadelphia's second-unit, if only because he fits way better with their current parts than Booker did. Booker might be a better player than Ilyasova in a vacuum, but the latter's floor-spacing is invaluable in every conceivable Sixers lineup. He affords Embiid more space on post-ups, and when the Sixers go bench heavy he will mitigate the spacing issues created by playing Amir Johnson and Ben Simmons simultaneously. The other good news is how easy it should be to acclimate him this late in the year. Unlike a typical veteran buyout addition, Ilyasova has played for the coach and team he's joining already, and within the last year. The play calls, defensive assignments, and other important jargon should still be able to be recalled, which will help him hit the ground running and make an impact right away. Philadelphia is never going to replicate Embiid's defensive impact when he hits the bench, so finding a way to add more offensive value is not a bad approach. Simmons' numbers drop off big time when Embiid hits the bench, and giving him another shooter should help dampen the drop off as much as possible. Barring another unforeseen development, don't expect any more impactful additions to the team this season. Ilyasova's addition should set the roster in stone, and this is the group that will be expected to win a playoff spot between now and mid-April.